Looking for a knowledgeable expert to guide you through San Luis Obispo? Explore our list of San Luis Obispo tours outlined below, featuring cider tasting tours with Hop on Beer Tours and Cal Poly campus walking tours, led by current Cal Poly students. Start planning your adventure to San Luis Obispo today! All throughout history, people have experienced and explored cultures through taste. Recently listed among Wine Enthusiast’s “Top 10 Wine Travel Getaways,” San Luis Obispo’s thriving wine country currently produces nearly two dozen wine varietals. Similarly, the booming craft beer scene has grown to include over 7 unique breweries, each with their own styles and heritage. Take a tour with organized transportation or gather up your friends for the Central Coast Outdoors wine biking tour. Read on for some local beer and wine tours to book for your next San Luis Obispo vacation. Owned by a certified sommelier, 101 Wine Tours caters to your group’s preference of wines and wineries. Add on a beer, cider, olive oil or spirit tasting for an extra special event. Don’t worry about how you’ll get there—there are three transportation options to take you from winery to winery, hosting groups up to 14. Big SLO Bike is the latest and greatest way to get around San Luis Obispo. You and 13 of your friends can pedal your way around the area with a guide that’s sure to make you smile. They offer three different tours: microbreweries, wine and bites and just cruisin’, which is perfect for family events. Explore SLO Wine Country with an educational twist. On top of tasting Edna Valley’s best, enjoy a picnic lunch and knowledgeable guides who will drive you from winery to winery. Another bonus: they offer dog-friendly tours so you and your sidekick can explore the area together. Literally “hop on” to this private beer tour! Their door-to-door service conveniently picks you up from your hotel or home for a 4-hour tour to three great San Luis Obispo breweries. Take a beer tour or a combination beer and wine tour in one of their limo buses or a walking beer tour with a pizza lunch at SLO Brew. Request a ride with SLO Safe Ride, a hassle-free way to wine taste in San Luis Obispo wine country! All you have to do is create your own schedule or have their staff assist you, pick from one of their luxury vehicles and enjoy a day in the vineyards! Even customize your experience to include anything from catered lunches to winemaker meet-and-greets. No matter the occasion, Uncorked Wine Tours offers a customizable experience for you and your group. Vineyard tours, food pairings and even zip-lining are available to make your day a blast! Pick from their wide variety of lunch menu options like sandwiches and salads and sit back, relax and enjoy your wine with no stress. Walk, taste and sip your way through Downtown San Luis Obispo. What better way to experience SLO’s farm to table cuisine than by trying several of the area’s best restaurants themselves? These food tours let you enjoy SLO’s quaint, historic downtown area while immersing you in the flavors and cuisines that live here. Read on for our favorite food tours in town. Visit unique destinations on one of their two tours. Taste of SLO’s Downtown Food Tour takes you through Santa Maria-style BBQ, artisan gelato, craft beers and Central Coast Wines, Latin-style food and more. Alternatively, the Mojo Food Tour explores Italian delicatessen specialties, rotisserie chicken, international or local wines, local seafood and more. These 2-3 hour long tours are for all ages and accommodations can be made for all dietary needs. Central Coast Food Tour offers small group, personalized tours in Downtown San Luis Obispo, allowing you to enjoy the best local cuisine with stops at off the beaten path culinary treasures. While walking through town, you’ll also travel back in time, passing by historical landmarks like Mission San Luis Obispo de Tolosa and others. Your knowledgeable guide will also share key highlights from the past. Downtown San Luis Obispo offers endless sights to see and attractions within a few short blocks of one another. Take a self-guided tour along the Downtown SLO Walking Tour, featuring the historic Mission San Luis Obispo de Tolosa, Secret Garden Organic Herb Shop, the iconic Boo Boo Records and more. Or, hop on a tour with East Wellbeing & Tea Spa who is now offering short tours of San Luis Obispo in their E-Tuk 6 passenger vehicle with free pick up and drop off from SLO hotels or Downtown SLO area. Hop aboard the SLOCO Pedal Cab for a leisurely, 3-wheeled adventure. Accommodating up to 3 guests per trip, this open-carriage, rickshaw-style pedal cab offers customizable tours throughout San Luis Obispo and the surrounding areas. Soak in the sun and sights around town or schedule a shuttle from bar to bar. Short trips around town range from just $5-$20, making the SLOCO Pedal Cab a fun, affordable alternative to traditional transportation. Take a step back in time with a Secret SLO history tour. Learn about the city’s past and the influence of women, railroad, and others that made San Luis Obispo what it is today. Knowledgeable tour guides will lead you through a tour of your choice including “Ghosts of San Luis Obispo,” “Rise of a Railroad Town,” or “Victorian Houses, Wild West Lives,” just to name a few. 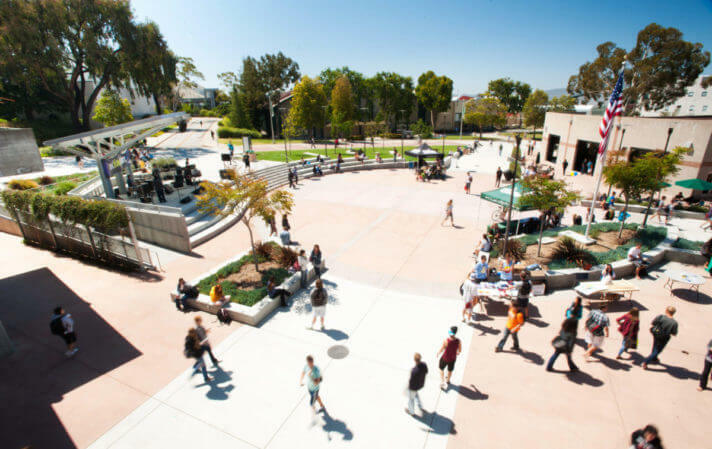 Whether you’re a prospective student or visiting alumni, Cal Poly San Luis Obispo offers various tours from self-guided to student-led campus tours Monday through Friday. Below outlines all the guided tours to give you a peek at the Mustang lifestyle. Tour times vary, so be sure to register here for a time that works best for you.